Tonight's topic is lifespan reality check, and some other stuff related to costs. 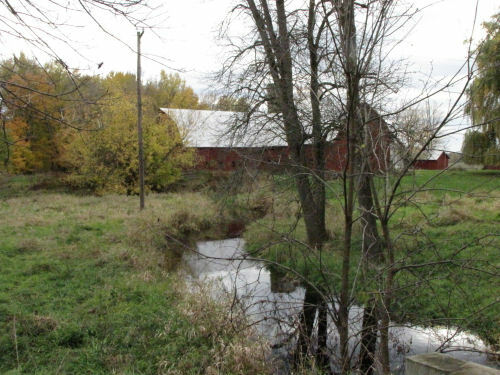 First, I'll relate an anecdote from a friend who recently traveled through Minnesota. That state has invested heavily in wind power generation. However, he noticed that very few of the turbines were in motion. He did some asking around, and here's what he was told. The wind turbines only have an overall lifespan of 20 years, and there is a huge amount of wear-and-tear maintenance on each one. Because of this, the power companies keep them braked (not in motion and generating) unless there is a shortage of power from their traditional generation sources. The cost of putting up each commercial turbine is $3-4 million,1 and can generate 2 MW. The lifespan is 20 years. The full environmental impacts aren't completely understood yet, which is to say there is still a lot of debate about them. Solar power isn't a commercially viable option yet in most places. Actually, the only way to compare costs is the production cost per kW hour. Here's a little table. I've left out a bunch of variations on the options. This supposedly takes in all the costs of construction, maintenance, and fuel costs. Notice that the two sources of info disagree by up to an order of magnitude. So there's a lot of room there for discussion. Today's topic is jobs. Wind power is supposed to create more jobs. OK, let's be honest. Any new power generation method is going to create jobs. These 56 turbines (plus some extras) came to Ludington by train and truck. 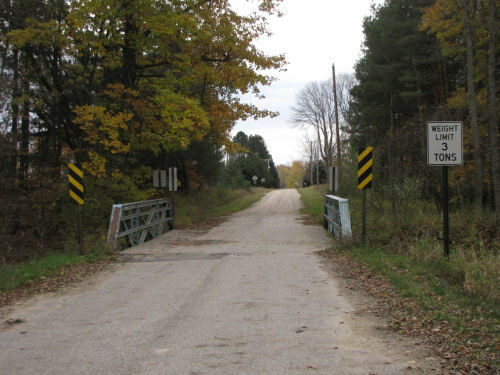 The bodies were brought in on Marquette Rail, a small rail line. That business certainly had a West Michigan impact. Every tower has four sections and one section fits on one rail car. There was a huge staging area where the tower bodies, blades, rotor housings, and the nacelle (the big box that holds the gears and generator) were all stored until transport to the construction sites. That was all done by truck. Were they local trucks and drivers? I don't actually know, but my guess would be "no." Every truck I ever saw was one of these same plain red ones. There is a name on the door, but I didn't get a good enough picture of one to read it. The reason I think these must be special trucks, with specially trained drivers is because of the problem of moving the blades. Each blade is two truck-lengths long. Turning corners with those babies was not an average moving job. One morning, doing the paper route, I was held up while they maneuvered blades out of the staging areas and onto the roads. It took numerous back-ups and pull-forwards to turn the corner. Some of the turbines were taken to Wisconsin on the S.S.Badger ferry. That is definitely local jobs. See Twin Queens of the Lakes for pictures of the Badger. Every road where the blades were taken had to have the corners widened, so there was loose gravel and orange barrels at each of those for the summer. I presume local construction crews did that work. Now, where did the parts come from? Well, that company name on the tower section is Vestas. That's a Danish company. They do have plants in the United States, but not in Michigan. As you can imagine, there are not many companies that make these specialized machines. And where is this power going to go? It will stay in Michigan, but is being sent to the other side of the state. And, there was quite a lot of disruption of local business. Almost everyone I know was held up at one time or another waiting for the trucks. And those delays were sometimes as much as 30 minutes. That's not good for other kinds of jobs. Over the next few days I'm going to come as close to being political as you'll likely ever hear me. The topic is political mainly because there is a proposal on the Michigan ballot to require companies to get 25% of their energy from renewable sources before 2025. And the proposal is worded that this requirement be put in as a change to the state constitution. I'm going to attempt to just present some facts and not tip my hand as to how I'm going to vote. The ads on TV have been so nasty and polarized that it's very hard to tell what's true and what isn't. 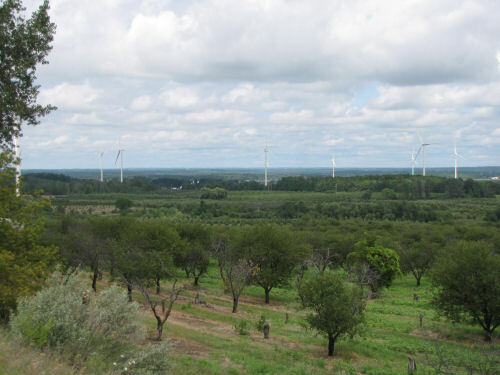 Today's topic is the change to the local landscape that wind turbines cause. Although renewable sources also include solar and biomass options, most of the buzz is about wind power. 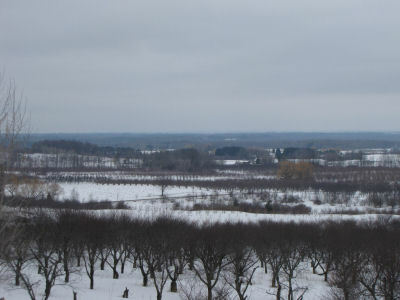 In March 2011, I took this picture from the highest point in Mason County, looking toward my house (which you can't see- it's in the next-to-farthest ridge of trees). Here's what that same view looks like now. This picture was taken this summer. 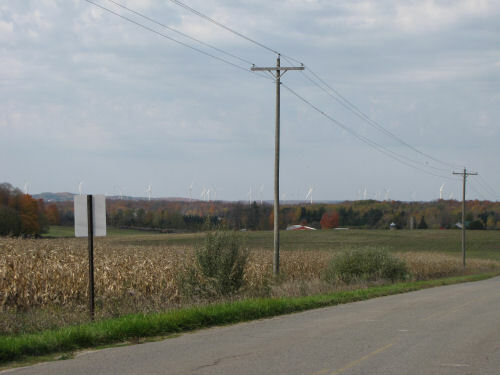 There are now 56 wind turbines clustered in two townships in the southwest corner of our county. As you can tell, this is only a few of them, but they sure do change the looks of the countryside. I keep being surprised at their visibility. I snapped this picture from the US 31 Freeway at Hart. From this point, the turbines are 12 miles away! 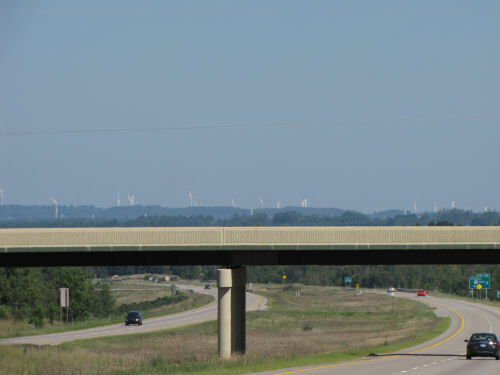 In this next picture, the turbines are only about 5 miles away, but this view is from the east side of the county, looking west. 25 of the towers can be seen from here. 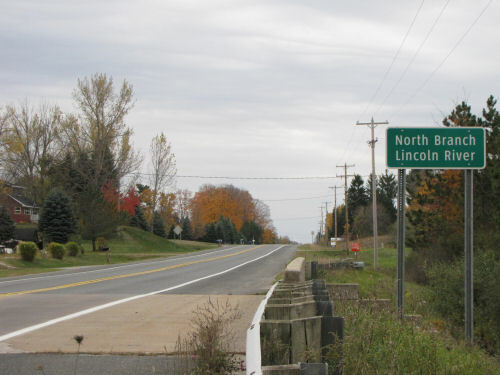 Although they don't seem to be visible from Ludington north, they really change the whole southwest quadrant of the county. Some people think the turbines are graceful and have a beauty of their own. Others think they are out of proportion with the rural character of the fruit farms which they now populate. There are many local people who are quite angry about their presence. RULES: This could be a hot topic. The big rule is that any comments must be respectful of differing points of view. I have veto power, and will delete any disdainful or nasty posts. Today there was a dinner following church, and I ate what I thought was reasonable, but by the time we were part way home, my body was saying "WAY too much food." So I had Om dump me out, so I could walk the last few miles home and work some of that off. On the way, I passed (in the opposite order) a lost opportunity, and also one that I finally found. Doesn't look like much, does it? 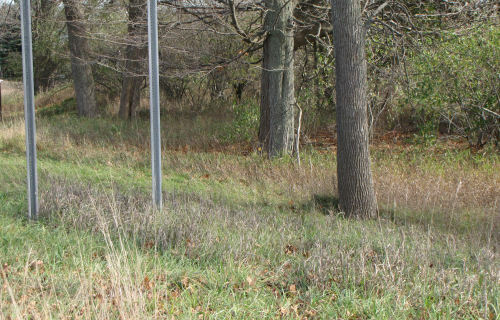 Before they widened the road in 1990, this was the site of a small, but shady, roadside rest area. It's less than a mile from our house. I used to always think that I should pack up a picnic lunch and walk down there with the boys (they were little then, of course) and make the small outing into a fun event. But I never did it. The boys are now grown (as you know), and the rest area is gone, crowded out by three more traffic lanes. It's certainly not an earth-shaking loss, but I'm always reminded that we miss out on many small joys just because we never get around to them. It doesn't look like much either. 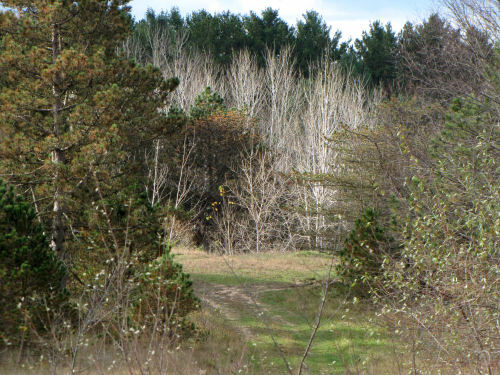 When the rest area disappeared, this intriguing space appeared. 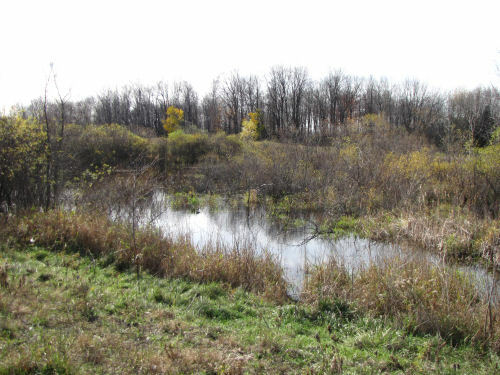 It's just a storm water collection area, AKA a wetland. 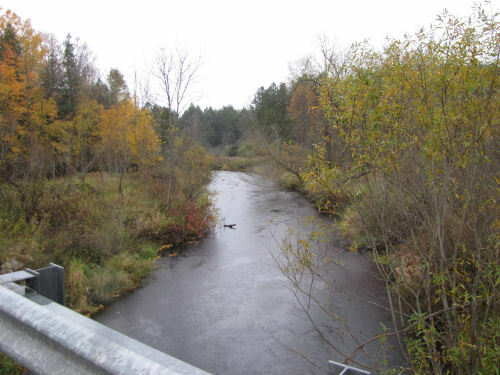 It has no inflowing creek or outflow. And of all the goofy things, after they dug this shallow space of about two acres, they put a chain-link face around it. And they did a good job. 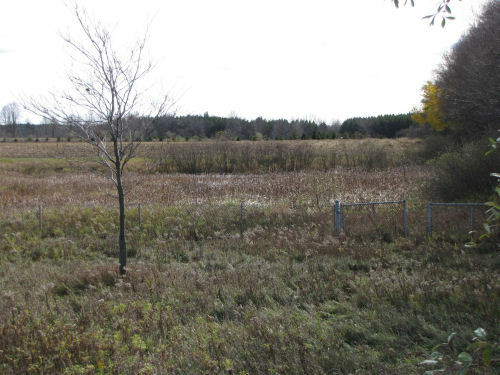 The fence is four feet high and the bottom edge is buried to some unknown depth. I always considered this a personal affront. 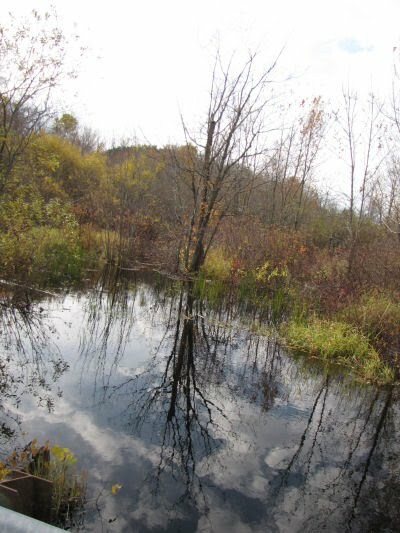 I was studying to be a wetland specialist, and I couldn't access this wetland also less than a mile from my house. Can you see the fence? Look at the fence some more. The gate is open! I have no idea if that is some sort of error, because it used to be locked, but I wasn't about to pass up this opportunity. I started around the inside of the fence to the right. Pretty soon I scared up a resting deer. With only about three steps of head start it went over the fence as easily as you or I might step over a small log. Shall I mention (as I have before) that dry feet are over-rated? However, I didn't really want to get in too deep, so I back-tracked and went around the other way. That was a better choice. 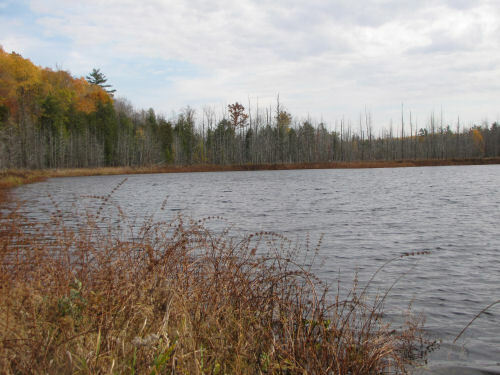 There is open water along the east and back sides, with raised bank between the water and the fence. 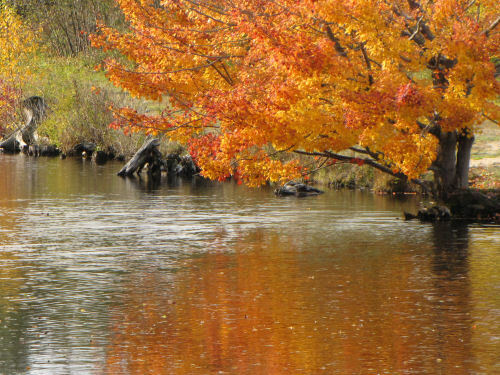 I found one spot on the bank where I could take my camp chair, sit and read and watch for any wildlife. That fence seems so ridiculous. Of course the deer and the birds can get in, and I suppose snakes, mice, etc. But I didn't find any holes or breaks where muskrat or rabbits could sneak through. I'm really curious about the wildlife there. I did watch some birds today- maybe more on that another day. And enjoyed the willows growing along the edges. Didn't see any particularly exciting plants, but maybe the gate will still be open in the spring. I'm glad I didn't pass up this small opportunity! One of the most fun things for me is when I find something unexpected in a familiar place. Today, as I was walking Maggie out back, where we walk once or twice almost every day, I saw something completely different. Across the tracks, with the leaves pretty much fallen now, a small clearing was being lit by a sunbeam. Doesn't it just beckon you to enter? It must be magic- it was never there before! I really can't figure out what might be interesting to say about this. Four years ago today I began blogging at "My Quality Day." However... before that I blogged a bit at "Sharkbytes: Niblets from the Shark" beginning in November of 2007. However... before that I blogged at Xanga, under the same title, since May 14, 2004. That means I've been blabbing somewhat publicly for over eight years! It wasn't until "My Quality Day" was launched that I began to do a regular daily entry. The Shark's Wisdom Tooth is definitely one of my favorites. From the blogger "Niblets", Confessions of an Acetylcholine Junkie was one of my early newspaper columns, and defines me pretty well. On MQD, there are 1473 posts to choose from. Yikes! I don't think I can even begin to pick my favorites, or the best, or blah, blah, blah. 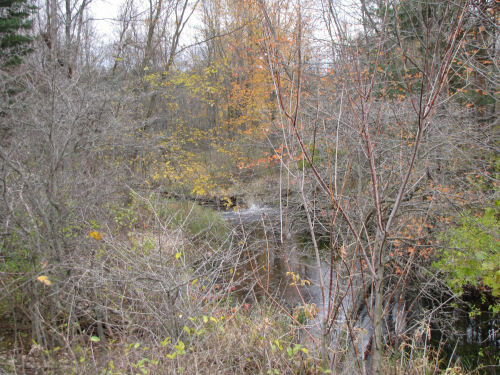 See the Video is the news video of the day I completed the final miles of the North Country Trail. That's one of the defining milestones of my life. And I think that's enough! No big deal if you don't want to read extra stuff. I think maybe this blogoversary is more about me realizing how much I've changed since 2004. 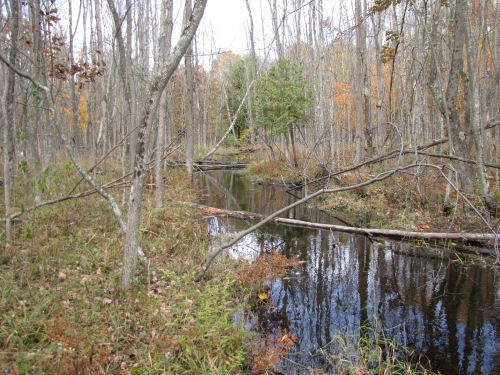 Back then I was still working on hiking the North Country Trail. I was still writing my first book. Maggie was much younger (weren't we all?). Since then, in a small pond of trail people and friends, I've become something of a big public fish. OK, maybe a medium-sized public fish. I'm now writing a monthly newspaper column, and am working on my fourth mystery, and the sequel to NCC, which will be called North Country Quest. Through "My Quality Day" I've made a number of friends, around the world! And I've even met a few of you in person. Thanks for celebrating with me. If there is an entry at MQD that was memorable for you, it would be fun if you mentioned it in a comment. Most of all, thank you for reading! A writer without readers is lonely indeed. 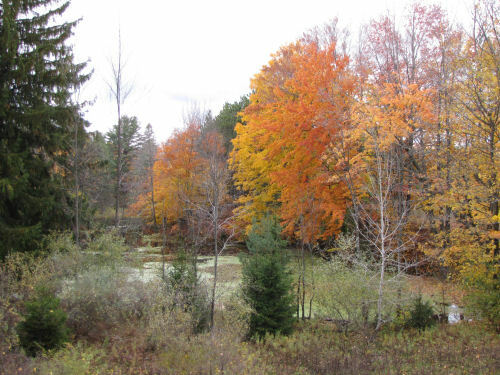 Do certain trees always turn certain colors in the fall? Always is probably a stretch, but generally this can be true. 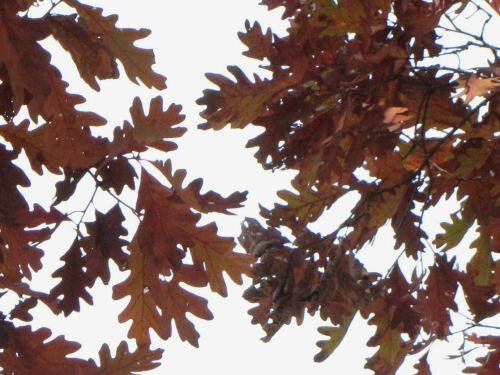 How about those lines of oak trees that become a deep maroon each year? 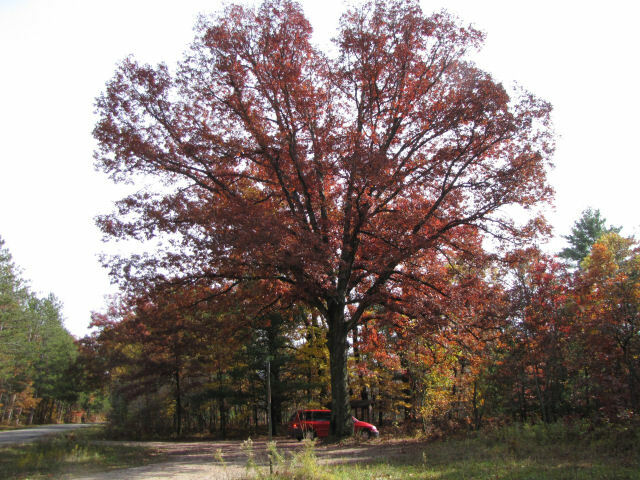 Maroon is a shade of red, so you might think these are red oak. Not so. 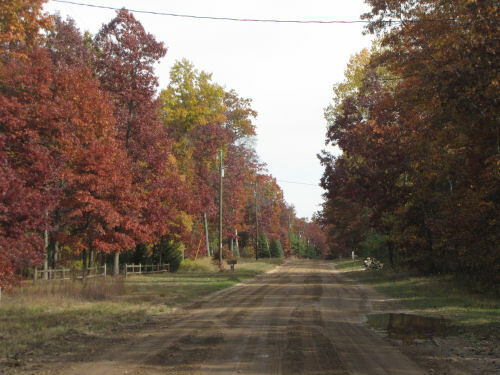 I checked a lot of these trees last week, and every one that color was a white oak! Here's one that grew up in the open- spreading nicely. It may not be completely typical though. My tree book says the single trunk is usually distinct about 2/3 of the way up the tree. Not true here. Tomorrow is an important blogging date for me. Stay tuned. It wasn't so many months ago that you heard about Josh's successful cataract surgeries. Now it's Om's turn. I'm getting to be an expert at being the person who drives, carries the stuff, and sits with the patient. 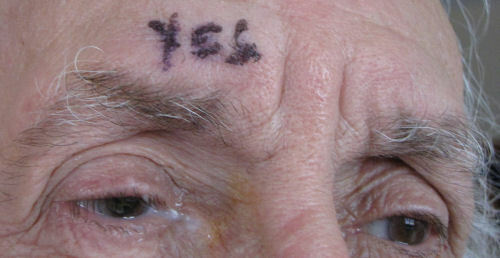 They are really serious about making sure there aren't any errors in which eye is done! The biggest difference is that Om's doctor is in Muskegon, so there was more of the driving part. But we ate lunch out, so that was nice. It all went well. We are doing the paper route together tomorrow. And many, many thanks for all the good wishes and prayers! 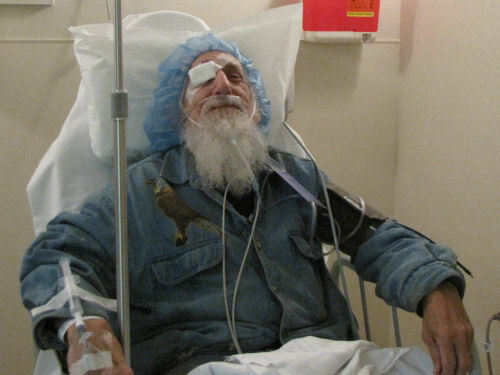 A former pastor of ours had "routine" eye surgery a few years ago, and died... just one of those things. But it can happen, so it's always great to know that all the prayers help assure that the outcome will be the correct one (whatever it is). Fog, drizzle, rain, clouds were the standard for the day today. I had a few work cases. 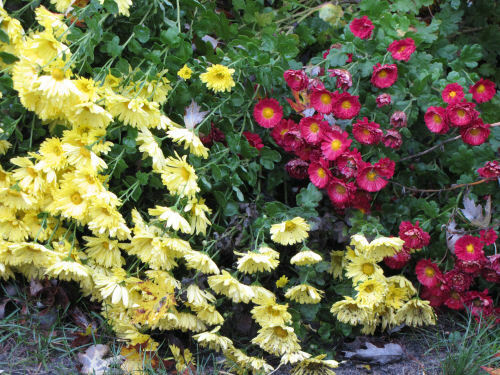 Despite the dull light, red, orange, and yellow were determined to shine. Omer's having cataract surgery tomorrow. He's a little anxious about it. 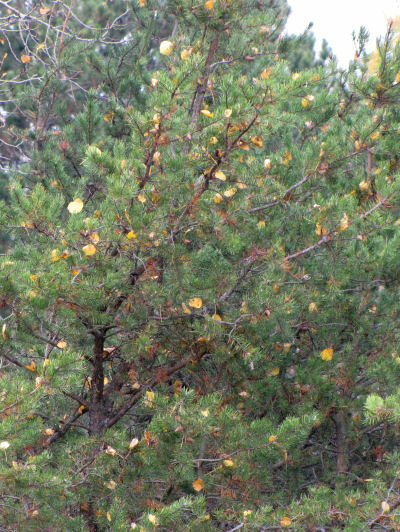 The golden aspen leaves decorate a jackpine already. Perhaps the tree is dressing up early for Christmas. 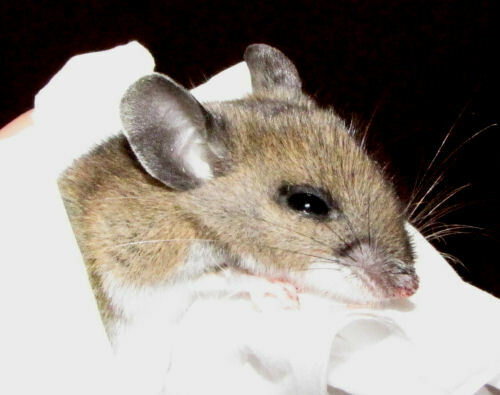 Here's a little deer mouse. I'm sorry to tell you that this is a partially sad story. But I have rules. The rules are: I really LOVE these little cuties when they agree to live outside. However, they are not allowed to live in my pantry, and/or run over my bare feet when I'm watching TV. I think a litter of deer mice was born in our basement, matured about three weeks ago and staked out their own spaces. Over the past 21 days I've interacted with the family. Mouse #1- Very tiny! Sat at my feet and stared up at me. I grabbed it with a kleenex and released it outside. Welcome to the cold world, little one. Mouse #2- Wandered upstairs and Maggie dispatched it the next morning. She was always a good mouser. Especially for a d-o-g. Mouse #3- Growing. Sat on the back of the couch right beside me and stared at me. I grabbed it with a kleenex and released it outside. I think #1 and #3 mice in that litter must have been developmentally disabled. Whoever heard of catching a healthy mouse in the hand? Mouse #4- Legally insane, then legally dead. It committed suicide (probably accidentally) by jumping in the toilet. Hmmm. Mouse #5- Got all the brains in the family, and the speed. It's been racing around the basement (where we have our TV, bedroom, etc) like a banshee. It knocks things over, gallops like a small horse. Wait... make that past tense. Joan (that would be me) bought some poison blocks, which #5 (and #6) have devoured with great enthusiasm. Tonight, #5 (pictured) was walking slowly across the floor. I grabbed it with... well, you know the drill... and sent it outside. Yes, it's dying. It makes me sad to do that, but I'm not interested in sharing my food. Mouse #6- Still loose upstairs. Last seen on the kitchen floor mat. It would be great if I could catch it or it would die in plain sight. Otherwise, we'll soon have a "lovely" odor in the walls for a few days. I hate killing things, even mice. But my rule on sharing food spaces is inflexible. Sorry. I've showed you the cemetery pond before. It's not a very pretty place, to be honest. It's always scummy because the water moves so slowly, and it has no nice vantage points. 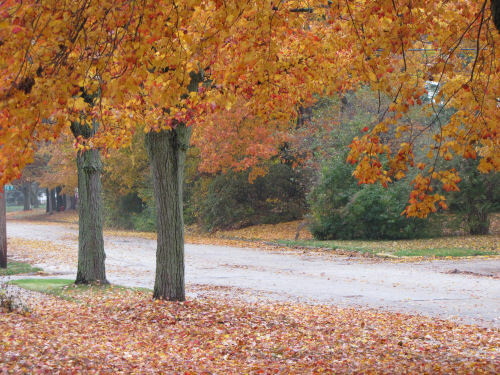 However, I've noticed this week that the trees on the east side have nice color, so I though maybe it might be looking its best. I stopped there today and snapped a picture. I have a few bloggy comments to make. Since the demise of Entrecard, my Alexa ranking has sure been tanking. I have no good ideas for getting new eyes here. Also, all you anonymous commenters: have you noticed that your comments never show up even though I don't have verification? Blogger does a really good job of weeding you all out, without me doing a single thing. Why not give it up. You are wasting your time. Last paper route day tomorrow. Sundays we have to get up at 2:30. Bedtime soon, I think. Today I felt better than yesterday. Thank goodness! Still working on reporting for this week's work cases. Here are a couple of my favorite pictures from earlier in the week. 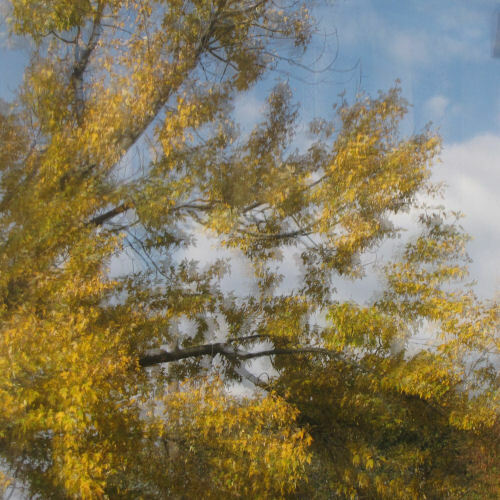 Reflections of autumn trees in a lake, and in a window. The window must be triple pane glass and it made a really interesting image. Have to go to bed. Two more days of this. 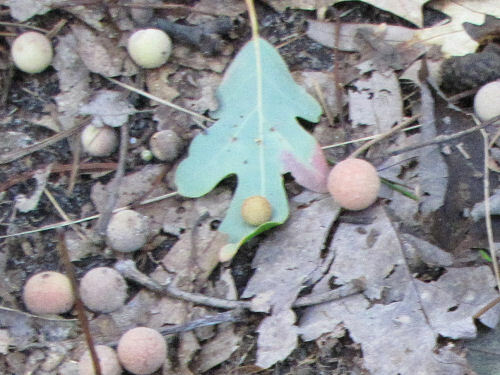 Although I was really certain of the identification of the Succulent Oak Gall, I still hadn't seen one actually on a tree. For some reason, these galls apparently all fall to the ground at some point in the cycle. Since I don't think I've ever seen these before this year, I have no personal knowledge bank on the topic. 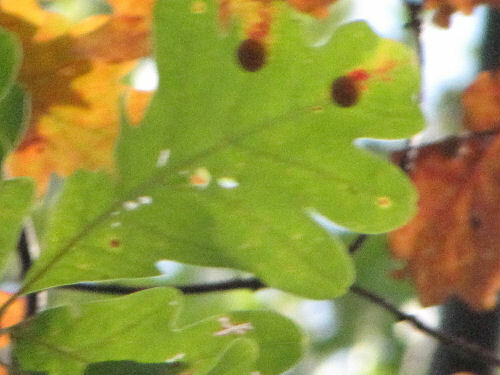 The one reference I found that had photos showed the little balls attached to the undersides of white oak leaves. In the first picture I showed a couple of weeks ago, there is a little ball on a leaf, but is it attached? Or did it simply fall and land on a fallen leaf? Since then, I've been hunting in the leaves above every patch of the galls I've found, but it appeared they had all fallen! Finally, in Nordhouse last week, I did see a couple of balls that were still attached. 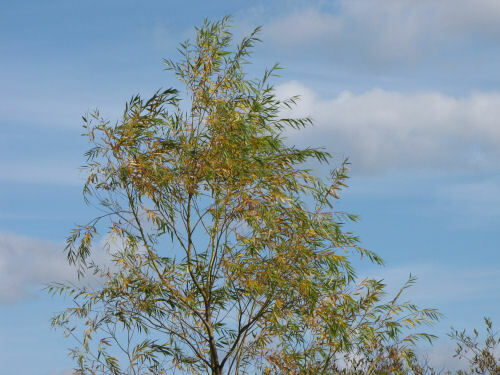 But they were high in the tree, and the wind was blowing so that the leaves were in constant motion. 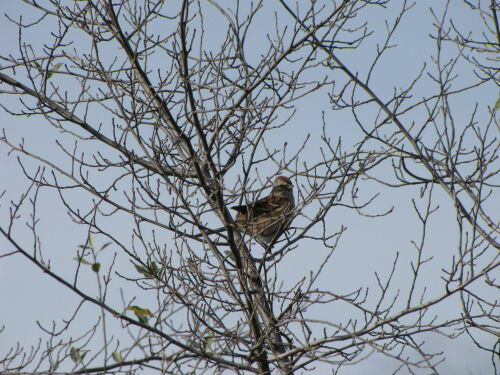 The result is a picture that is good enough to prove how they are seen on the tree, but not in very good focus. So there you have it. These seem to all be on white oak. Maybe some day I'll get a picture of the little wasp that causes it. I'm going to bed. I think I've finally made it to tired enough to get to sleep early.